This homemade dairy-free and vegan ranch dressing recipe is made from vegan mayonnaise, soy milk, garlic powder and onion powder for seasoning, a touch of apple cider vinegar and finally some fresh parsley and fresh dill to round out all the flavors. Several past recipe testers gave this vegan ranch dressing recipe positive reviews, both as a salad dressing or thickened up and used as a dip. I actually much prefer homemade vegan ranch dressings to store bought, as each brand of store-bought vegan ranch dressing I've ever tried has always tasted a little bit off to me. It's just my personal opinion, but they're just not quite as tasty as I'd like them to be. Note that while often, soy milk and other non-dairy milk substitutes (such as almond milk, rice milk or coconut milk) can be used interchangeably, this particular recipe will work best with a plain or unsweetened soy milk. Anything else may slightly change the taste of the finished dressing. Place all of the ingredients except for the parsley and the dill in a blender or food processor and process it all together until smooth and creamy. Next, add in the fresh chopped parsley and the dill and pulse together just until the parsley and dill are both very finely minced. Taste, and adjust the seasonings to taste. Transfer to a small bowl or serving container (I like to use a mason jar) and place in the fridge; dressing will thicken slightly and set as it cools. 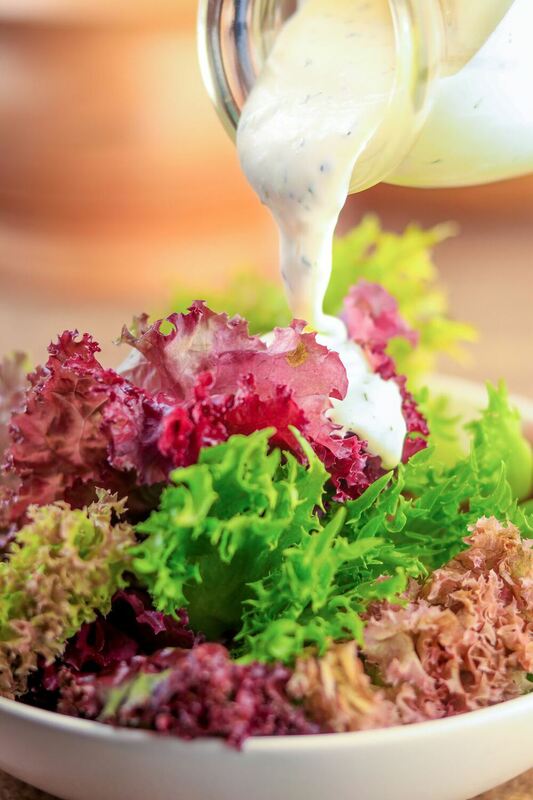 To use your ranch dressing as a dip, just add a bit extra mayonnaise and a bit less soy milk to make it thicker.